Having served as Chief of the Kijicho Manito Madaouskarini Algonquin Nation for more than two decades, Katherine Cannon has been instrumental in educating Indigenous and non-Indigenous residents and visitors in the area about the history and culture of the Algonquin people. Although now retired, she continues to be an active member of the community and a passionate advocate for the nature-based values intrinsic to Algonquin culture. Noticing that the level of interest in the community has grown significantly in recent years, Cannon hopes that by sharing the wisdom she has attained from the various roles she has held, that more people will come to appreciate what it means to be Algonquin. “The more history people know the more they understand why we’re trying to do what we are doing with trying to bring our culture back,” Cannon says. Growing up as a child in Maynooth, Cannon says being Algonquin wasn’t something people talked about because of the attitude towards Indigenous people at the time. In fact, she remembers being told by her parents not to announce their family’s Indigenous heritage. Acknowledging that progress is being made in regard to reconciliation, Cannon says she is very grateful that there are now many opportunities to celebrate Indigenous culture. Although people have become curious about Indigenous values and history, she says it can sometimes be a challenge to get all of the information out to everyone who wants to learn more because of this high level of interest. By means of her firsthand experience in cultural exchange, Cannon says she has come to appreciate the deeper value of different cultures. “We all came from the same place, and we are all going back to the same place … and that’s the land,” says Cannon. On top of the 22 years Cannon spent as Chief she also served for 26 years as the Algonquin land claim negotiations representative. Having been involved in this process since the beginning, she has fond memories of walking the land to define the boundaries of the land claim. During this stage in the process, Cannon says they discovered several sacred burial and historical sites, as well as many artifacts which all tell a story of what life was like for the first people to inhabit this land. Highlighting the sacredness of the land and water, she says it is essential for the land claim to be resolved if meaningful reconciliation to take place. “We are trying to get a little bit of our land and water back for our own personal use, so we have a place to practice our culture without treading on other people’s toes or on their property,” says Cannon. Once the claim is settled, Cannon says they plan to archive the artifacts they’ve found in a museum-type facility located on the Algonquins of Pikwàkanagàn First Nation. Located in the centre of Algonquin territory, she says Pikwàkanagàn is the perfect place for such an educational facility. 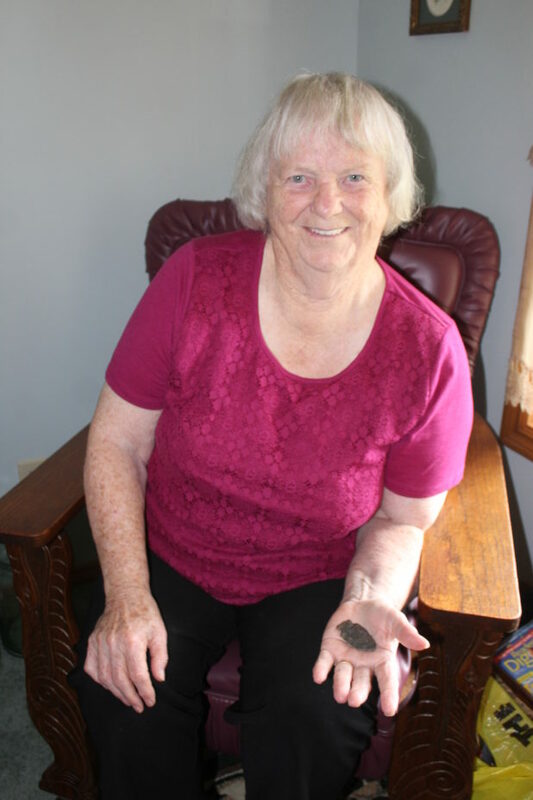 With more than a dozen arrowheads, scrapers and other artifacts in her personal collection, she intends to add them to the collection to be exhibited in Pikwàkanagàn as well. Courtesy of Stan Blank, Cannon recently added another piece to her collection. While hiking around the potholes on Peterson Road in Hastings Highlands four years ago, she says Blank recovered an arrowhead that is estimated to be more than 4,000 years old. Though in the 1990s many of these potholes were covered in with gravel by a logging operation in the area, because it is a place where her ancestors gathered to grind corn and store water, she says this location remains a sacred place to the Algonquin people. “There is still a need for contact with the land and the connection there,” says Cannon. Because every time a new federal government is elected the team working on the Algonquin land claim changes, Cannon says the process of settling the claim has been delayed every four years. That said, she expects the claim to be resolved sometime in the next five years.